I wish I taught at this Uni. My class would be called Pink and Print 101: The Design of Nightmares. P.S. Thanks for the link, E! Are you feeling like a monster tonight? 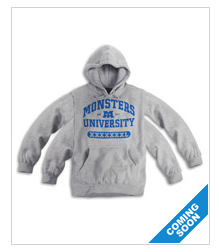 I bet that hoodie doesn't come with the extra pair of hands you need, though. Monsters have all the fun. I bet they're more efficient than mothers.